Have defined all relative terminology including berthing facilities, docks, boat hoists, boat stations & boat houses. Have defined as extensions from lakefront properties. All pre-existing permanent and seasonal residential structures are allowed. 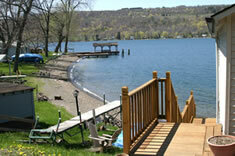 All pre-existing NYS permits for non-residential uses of permanent or seasonal docks are allowed. Replacement allowed for non-conforming structures damaged in natural disasters, fire, or vandalism. Building permits are required for all “permanent” structures. Available from municipal Code Enforcement Officers. Exceptions handled through normal town Zoning variance procedures.